Renee Smith says she has always been a land lover. So when a new found passion for sailing was discovered midway through 2017 her friends and family were very surprised. 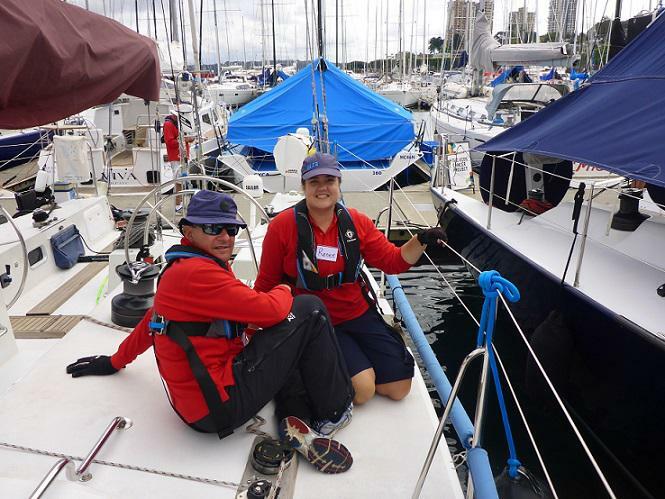 Renee says that sailing has taken her ‘way out’ of her comfort zone. However she says ‘when I find something that I am passionate about, I throw everything into it’. Renee who is an ‘incomplete paraplegic’ after damaging the lower part of her spinal cord in an accident nine years ago, was coaxed into sailing by her Aqua Instructors teenage daughters who are both passionate sailors, and she went along to the Women Who Sail’s ‘Gathering on the Bay’ event earlier this year with them and there was introduced to a number of the SWD girls, including Kristi Foster and they encouraged Renee to become involved. Renee says ‘I battled hard with the “l want to try, l don't want to try" thoughts for months, before l finally gave in and nervously ventured out for my first trial sail in July last year. At first I was really nervous on the water, because my strength and balance aren't good, and l knew I'd have to trust strangers for help, which is hard for me to do. But sailing away and leaving my wheelchair behind on the dock was an incredibly freeing moment. Above: Renee Steers other Wheel Chair User's during a Winds of Joy Sail in 2017. As a teenager before her accident Renee was a keen horse rider and competed in show jumping, and even volunteered with the ‘Riding for the Disabled Association’. However an accident 3 months before her 21st birthday left her with a damaged spinal cord and the news that she wouldn’t ride again. ‘It took me a long time to learn to live differently. You hear of all these motivational stories of people with spinal injuries overcoming their situation, and for me it was really difficult because no matter how hard l worked l wasn't getting better. I kept asking ‘well why can’t I do it’, but eventually I came to accept my injury for what it is, and once I did that and accepted it, things became much easier to handle’. It took Renee three years to convince her medical team that she could ride again. And eventually, through the Riding for the Disabled Association she became a para-equestrian, competing in para dressage. ‘It is really quite a fulfilling hobby’, she says ‘and my horse gives me freedom by lending me his legs. But as it happens I haven’t been allowed back on my horse, after becoming quite ill nearly 12 months ago with what my medical team believes is MS. My medical team believe that riding would put too much stress on my body at the moment’. 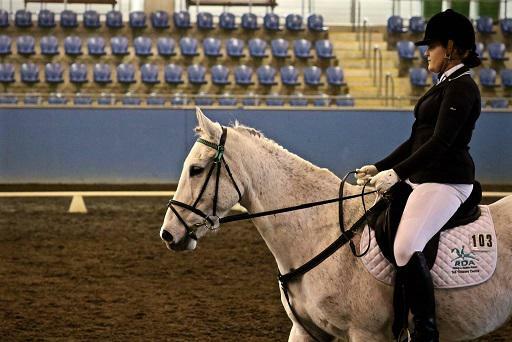 Above: Taking Part in Dressage Events with the Riding for the Disabled Association. Eager to find a new and fulfilling hobby, Renee found that returning to volunteering with an activity that empowers people with disabilities gives her great pleasure. For Renee she found that SWD is very similar to the Riding for the Disabled Association, and that she connects easily with people who also have a disability. ‘I relate with people who have disabilities so much easier than able bodied people, because they know what it’s like to have to learn to be adaptive. I can no longer walk around horse arenas because of my disabilities, but l can help sail a boat. And l get a real kick out of returning to the dock after sailing and then watching the shocked faces on the kids when l hop back in my wheelchair. On the water, they didn't even realise that I had a disability - l love being a living example of "l can" for them’. Once Renee got the experience of sailing in her veins, she convinced her boss to give her Thursdays off so that she could volunteer each week with SWD. ‘Luckily my boss agreed to me taking the day off. In my role as a researcher it is very easy to become too involved and work too many hours, so it was important, that I found something away from work to get involved in’. Getting the time off work was the easy part, she then had the challenge of getting herself to and from the Marina in Rushcutters Bay every week. ‘It takes me two and a half hours each way and involves two trains and a bus. It was quite an experience learning to catch trains on my own, hoping the train staff didn’t forget that I needed help to get on and off. Not being able to see signs through the crowds of people because I'm down low in my chair, as well as working out where the lifts were and what routes are accessible. At King Cross Station I have to rely on the kindness of strangers to help me up the steep ramp. Travelling alone initially caused a lot of trepidation, but each time I do it I see it as another challenge completed!’. But the travel is just part of the adventure for her day, as she volunteers for two sessions of the Winds of Joy Programs, morning and afternoon, sometimes even followed by Twilight Racing. ‘When I finally get there in the mornings I take about half an hour to just relax and prepare for the day’. Renee says that it is completely worth the effort and the pain. Even when, like on the day we spoke, she had a boat of very nervous younger children on-board and one wanting to sit on her lap. ‘After a while I forget about my own pain, because there is so much activity going on. And even when the kids need me to be more active for their own security, my pain is still there but it is all so worth it’. Renee of course has a goal with her sailing. ‘Thursday volunteering is my main focus, but I would like to get onto a racing crew and learn to be an adaptive sailor. James Hunter who is vision impaired and an experienced volunteer with SWD, has kind of taken me under his wing, and together with some of the more experienced crew from the Twilight Racing they are helping me develop ways to adapt to the different boats. I know “Kayle” quite well now, but when I go onto “You're Hired”, I feel a bit vulnerable, I have to crawl around on the boats and there isn’t much room for me to crouch down on “You're Hired”, unlike “Kayle” which has plenty of space for me. But the crew are helping me to develop ways. Everyone at SWD are so helpful and welcoming, they really are just like a big family. And as for that medical team who won’t let Renee on a horse are they happy for her to be sailing? Renee laughs ‘I think they have visions of sailing as just floating around the harbour drinking Champagne, and I am happy for them to keep thinking that’. From all of us at SWD, welcome to the family Renee. 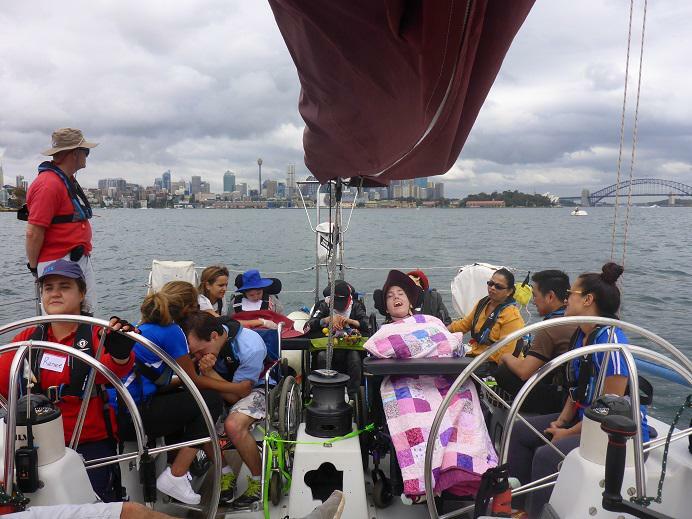 'When we’re out sailing, it is very easy for signs of our disability to go unnoticed'.